Even though I love all desserts almost equally, I tend to play favourites: cookies are usually my go-to, followed by pies and little fruity and chocolatey bites. Cakes are not at the top of my list; I think that’s probably because they are often associated with childhood baking memories, of which I don’t have that many. My mom rarely made any cakes (safe for this delicious, festive one), and when she did, usually in our house in the country, she had to fight our super temperamental oven: all desserts that went in there would come out almost always half burned- but we almost always ate them (apart from that one time, when she accidentally sprinkled a whole cake with corn flour, instead of icing sugar. I think we held off on that one). My sister has a teeny tiny sweet tooth (which, to this day, deeply mystifies me and it’s a fact I loathe and admire in equal measures), but she LOVES carrot cake. She hasn’t made it once and I’ve never seen her ordering it, but in her mind, it’s her favourite dessert. So, when she came to visit a few days ago I knew I had to make her the carrot cake to end all carrot cakes. 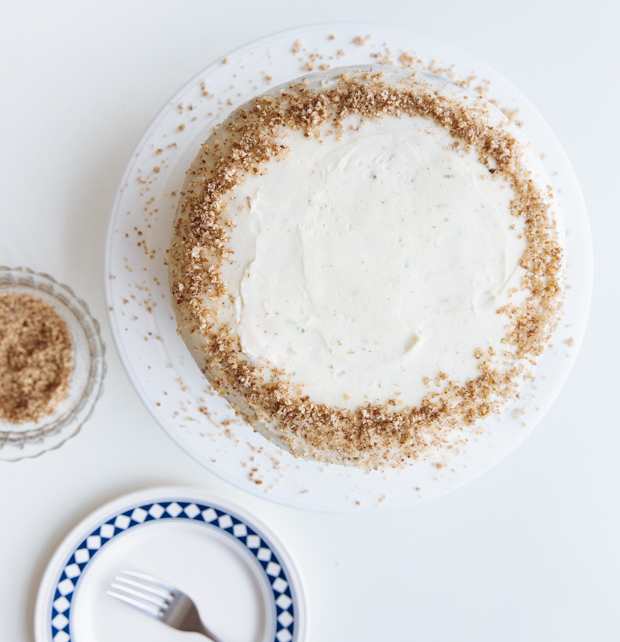 I’m talking lots of flavours, lots of layers and way too much cream cheese frosting. So here we go: vegetable oil and caster sugar, because this one needs to be moist and tender; crunchy carrots, grated and mixed with a juicy and tender mango, chopped pecans and spices- lots of ’em for extra flavour: cinnamon and nutmeg and a touch of turmeric too, for a bright and fragrant butter, ready for the oven. 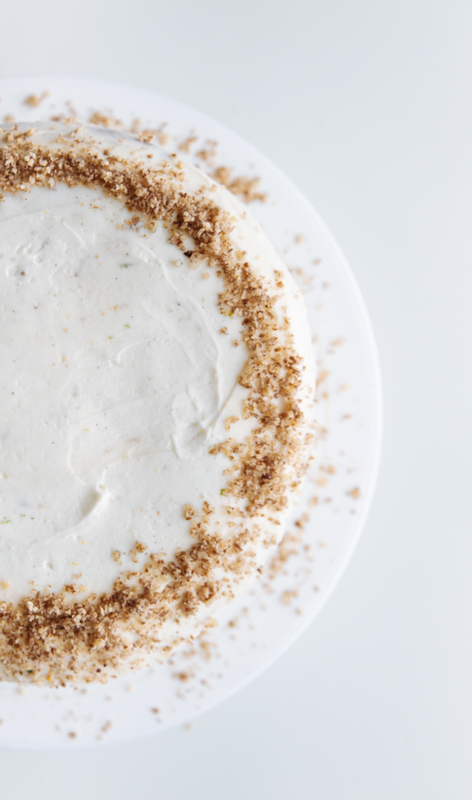 While the 3 little cakes are baking, filling up your kitchen with wonderful aromas, it’s time for a fluffy frosting: smooth cream cheese, icing sugar (not too much, we want to balance out the sweetness of the cake) and some fragrant lime zest to complement our carrots and mango. 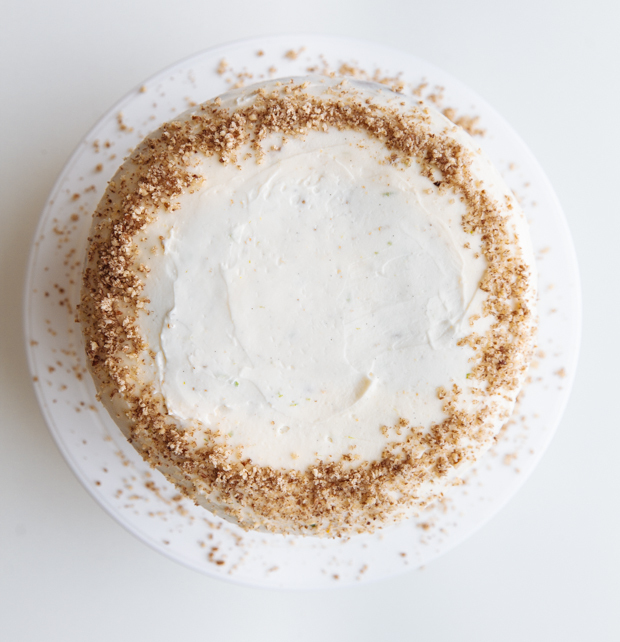 Spread between the layers and then over and around your cake- there can never been enough cream cheese frosting for a carrot cake. Like ever. Sprinkle some extra chopped pecans and refrigerate until ready to serve. Slice in very (and I mean very) generous portions and serve to your twin sister and your friends. Your friends- they’ll love it. Your sister may say that she expected you’d have eggs ready for her, because she didn’t have a decent breakfast on the plain and, anyways, she can’t have cake so early in the day. Damn you, tiny sweet tooth! *There are no photos of the sliced cake- I wanted to keep it intact in order to triumphantly present it to my ungrateful literal other half. I did, then I cut humongous slices for all of us and then- don’t know exactly what happened, but I somehow found myself too busy to take any photos. And then there was nothing left to take photos of. Preheat the oven to 160C (140C air). Line the 3 baking pans with parchment paper; set aside. In a large bowl, combine the flour, baking powder and soda, salt and spices; set aside. 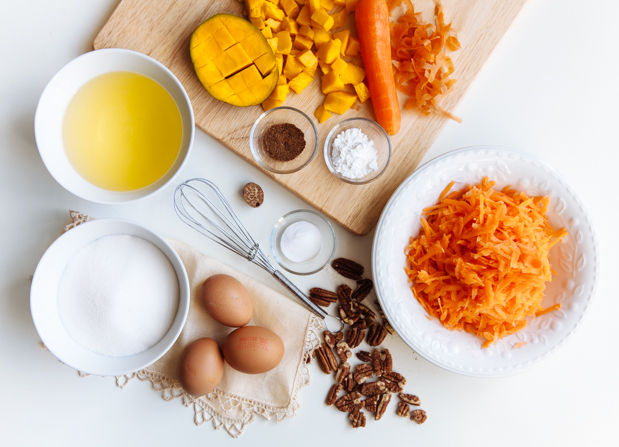 Beat the eggs with the sugar until light and fluffy; add the oil, grated carrots, pieces of mango and chopped pecans and continue beating until well mixed. Add the dry ingredients gradually and fold with a spatula until they are well incorporated. Divide between the three pans and bake for about 30’, or until a skewer inserted comes out clean. Let cool and remove from the pans. While the cakes are baking, prepare the frosting: beat the butter with the icing sugar until soft and creamy; add the cream cheese, vanilla extract and lime zest and continue beating until the mixture is smooth. Place in the fridge until the cakes are ready to be frosted. To assemble/ frost: place one layer on a cake stand and spread 1/4 of the frosting (place a big dollop in the middle and using a large spatula, start spreading all around), wiping down your knife regularly. Place the second layer on top and repeat with another 1/4 of the frosting; add the last layer, repeat and place in the fridge for about 30’ (the frosting will become more solid, which will help frost the sides). Take out of the fridge and add a little of the remaining 1/4 of the frosting on the side and spread it, holding your knife vertically down; repeat until you’ve used all the frosting. 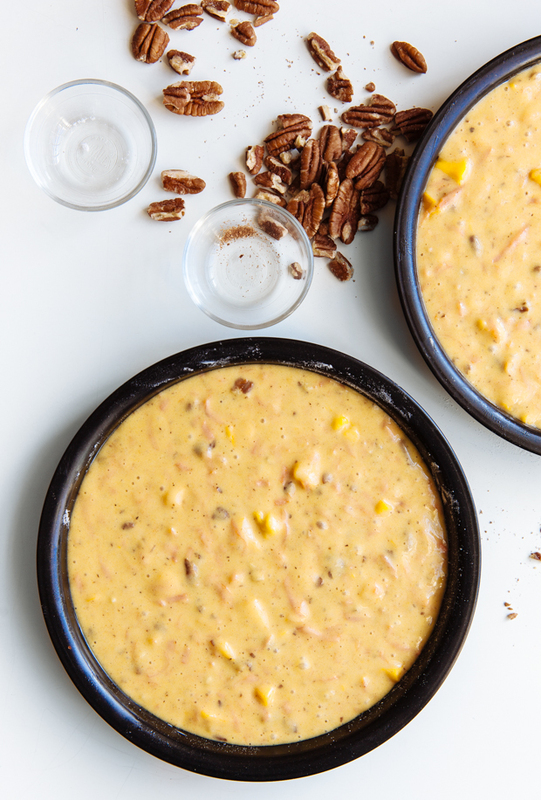 Smooth out the sides and top of the cake, sprinkle chopped pecans on the edges and refrigerate until ready to serve.